Finding a work life balance as an entrepreneur can be hard. Today I am sharing with you a few work life balance tips for entrepreneurs. BUT! It wasn’t always like that. 3 years ago I found myself overwhelmed even though I was doing something I loved and I had no work life balance at all. It’s taken me awhile to get here – balanced – that is. But how did I do it and what do I do to manage it to ensure it’s always there? 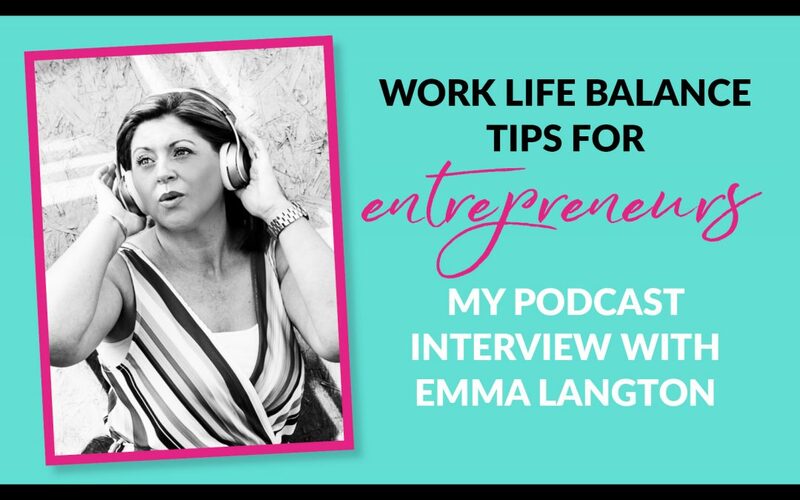 I was asked by Emma Langton Coaching & Hypnotherapy around August – off the back of that email I sent – to join Emma on her podcast – which talks about all things to help you get balance in business whether you’re a business leader or entrepreneur. In this open podcast I talk about starting my business three years ago and despite thinking it was going to be great running a business, I knew I had a hill to climb and lots of things to do including being the account person, marketing person, keyword google student and a whole lot more! Emma and I chat through the realisations, the self development, the support, outsourcing and what has been the deal-breaker for me. I share why I do this and how important it is to get a great work life balance tips for entrepreneurs . We also talk about what managing time and boundaries look like for me too…come have a listen – grab a cuppa and enjoy.